How do you choose the right sustainable adhesive label? Which is better? Compostable labels, recycled labels, or recycle-compatible labels? Not long ago there were few green packaging choices, but thankfully now it seems there are many good options to consider. Having more options is wonderful but it can become confusing, especially when trying to figure out which type of label you need and which sustainability claims are genuine. When it comes to adhesive labels, choosing wisely demonstrates to your customers that you are knowledgeable and sincere about your commitment to sustainability. As a pioneer in revolutionizing the sustainable label industry, Pure Labels provides the widest variety of genuinely sustainable adhesive labels. Which Sustainable Adhesive Label Should I Choose? Most often the labels you will be using are being placed on some kind of packaging. The material and type of packaging being used often dictates which type of sustainable adhesive labels would be the best choice. For Example: If you are using one of our biodegradable coffee bags, then the label should also be biodegradable. If you have certified compostable packaging, then a compostable adhesive label is the best choice as it does not contaminate the process in composting the waste. This allows your customers to simply compost the entire packaging, bag and label together. You should also choose your packaging and labels based on what your company is committed to. If your sustainable message is that your packaging (or products!) are recyclable, then make sure that you are also using recyclable adhesive labels that do not contaminate the recycling process. Not Sure Which PURE Labels Materials Meet Your Sustainability Needs? 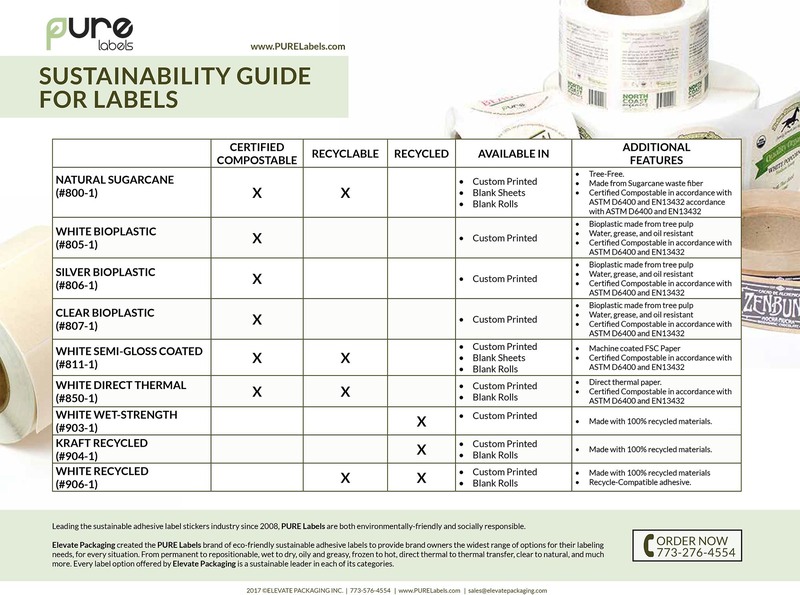 We've created a Label Sustainability Guide that you can download! Or check out Choose PURE Labels for more information. Your Connection to What's New at PURE Labels Sign Up Now! PURE Labels™ is the exclusive brand and division of Elevate Packaging, Inc.